How and why is flour bleached? Aging has important practical results. It has long been known that flour allowed to sit for one or two months develops better baking qualities; hence the practice of letting flour age before use (during this period, it is also naturally bleached by oxygen in the air). But done in this way, aging is a time- and space consuming, somewhat unpredictable procedure. Hence the use of chemicals both to accelerate and to control flour improvement. Aging effects the bonding characteristics of the gluten proteins in such a way that they form stronger, more elastic doughs. Bleaching, then, is a shortcut to flour that is uniformly white. Using chemicals, flour producers can get baking-quality products out immediately, rather than waiting for the grain to age and oxidize naturally. 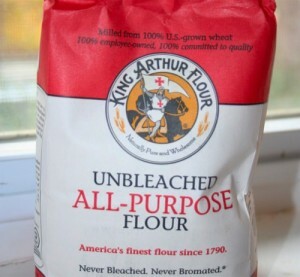 Peroxides are used as bleaching agents in flour processing. In the United States, the most common flour bleaching agent is benzoyl peroxide. (Yes, the same benzoyl peroxide topically used to treat acne.) Several nations, including the European Union, Canada, and China, have banned the use of benzoyl peroxide and other peroxides as food additives because of health concerns. What, then, is unbleached flour? Unbleached flour is, simply, flour that has been naturally aged after being milled. This label does not imply, though, that your flour has not been treated with chemicals (see the next section). Does unbleached flour also mean unbromated? Potassium bromate (KBrO3), is a flour “improver” that strengthens dough and allows for greater oven spring and higher rising in the oven. Potassium bromate, commonly referred to as simply “bromate” is a slow-acting oxidizer, contributing its functionality through out the mixing, fermentation and proofing stages, with important residual action during the early stages of baking. Azodicar-bonamide (ADA), potassium and calciumiodate, and calciumperoxide arerapid-acting oxidizers, while ascorbic acid (vitamin C) work s at intermediate rates, but all release their activity in mixing and proofing bromate, when applied within the prescribed limits (15 – 30ppm ), is completely used up during the bake leaving no trace in the finished product. How ever, if too much is used, or the bread is not baked long enough or at a high enough temperature, then a residual amount will remain. The primary concern regarding the use of bromates in baking is its demonstrated link to cancer in laboratory animals. It was first found to induce tumors in rats in 1982. However, since 1991, instead of banning bromate outright the FDA, with somewhat limited success, has merely encouraged bakers to voluntarily stop using it. Bromates have been banned in numerous countries, including the United Kingdom in 1990 and Canada in 1994. In addition, in 1991, California declared bromate a carcinogen under the state’s Proposition 65. As such, baked goods sold in California would have to bear a store level cancer warning if they contained more than a certain level of bromate. As a result, most California bakers have switched to bromate-free processes. Health risks surrounding bleached flour are unclear. Though other nations have prohibited the use of peroxides, American manufacturers are still allowed to use them under current Food and Drug Administration policy. Taste-wise, many people are able to detect a difference between chemically-treated flour and naturally aged flour. This unsettling taste may be compounded by the use of aluminum in cheap baking powder. In my opinion, the taste of unbleached, unbromated flour in a well-baked artisan bread is worlds better than chemical flour. In terms of cost, bleached flour is almost always less expensive because it’s easier to produce. It’s your call whether or not the tradeoff of taste and potential health risks is worth it.